The ASG Modelling addresses a variety of processes related to hydrogen embrittlement. 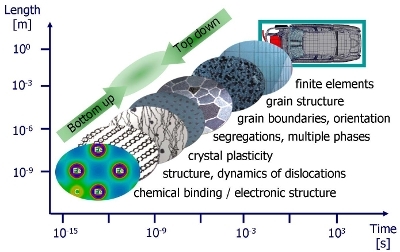 This includes ab initio studies on the solution/diffusion of hydrogen in bulk phases/grain boundaries, kinetic Monte-Carlo simulations based on ab initio diffusion barriers and the investigation of atomistic mechanisms such as hydrogen enhanced local plasticity. The Advanced Study Group (ASG) Modelling is the organizational unit which combines the theoretical materials simulation activities in the institutes collaborating with ICAMS. In this way it serves as a centre of competence for different concepts in materials modelling in order to support the research at ICAMS. At the same time the ASG contributes to the research of ICAMS with individual projects, which aim at a better understanding of steel properties at the atomistic scale by the means of ab initio methods. The heart of the ASG Modelling is situated at the Max-Planck-Institut für Eisenforschung GmbH in the department of Computational Materials Design (CM) of Prof. J. Neugebauer. Here, highly accurate simulation tools for the prediction of materials properties and processing, which are feasible on present day computers, are developed and applied. Within the department the inherent multiscale character of realistic materials is considered in a bottom-up approach, motivated by the fact that the electronic scale is the fundamental scale which eventually controls processes on the macroscale. This approach has the advantage that it can be based on the well established laws of quantum mechanics. It is therefore free of any adjustable or empirical parameters (ab initio), the elementary building blocks such as electrons and nuclei used in the simulations are identical to those in nature, and all equations defining the dynamics of these building blocks are well known. 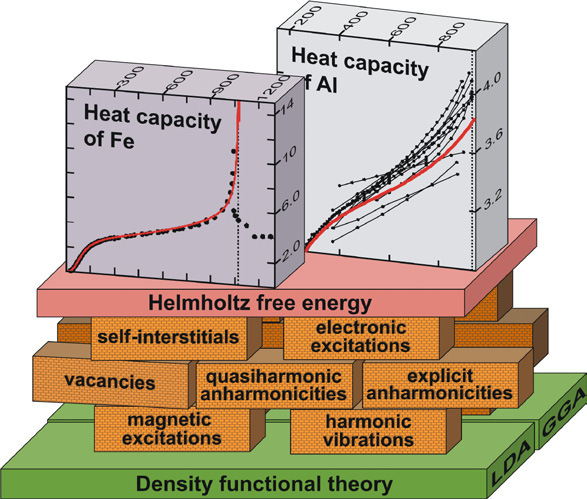 Comparison of experimental (dots) and ab initio derived (red lines) heat capacities (in kB) of Fe and Al as a function of temperature (in K). The results are based on highly accurate methods developed at the CM de-partment in the MPIE to determine all relevant contributions to the Helm-holtz free energy. Multiscale character of materials design. The ASG modelling follows a bottom-up approach, using well established laws of quantum mechanics for the fundamental scale of individual electrons and atoms.